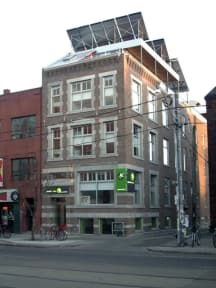 Planet Traveler Hostel i Toronto, Kanada : Boka nu! Welcome to Planet Traveler Hostel, the friendliest, greenest and most comfortable hostel Toronto has to offer. At Planet Traveler we work tirelessly to ensure your time in Toronto is as enjoyable as possible. 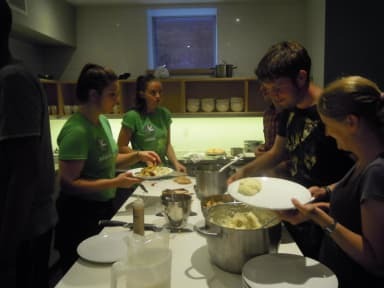 We understand that it’s guests that make a hostel stay memorable, and from the abundance of amenities to the friendly staff and exciting daily events, we do everything we can to create memories that will last a lifetime. Our turn of the century building has been restored from the ground up to suit the needs of the most discerning traveler. The property has been renovated and rebuilt into a purpose-designed hostel incorporating the latest in green technology: geothermal heating, photovoltaic electrical production, solar thermal water heating, building-wide LED lighting and wastewater heat reclamation. Secure dorms have custom-designed hotel style ensuite bathrooms, private locker areas and extra comfy memory foam mattresses to ensure the best night's sleep you'll ever have away from home. Cook up a feast in our fully-appointed kitchen or relax and meet other travelers in our beautifully designed common area, which features a fireplace, phone booths, a dining area and an awesome couch where you can watch TV, movies and major sporting events. Enjoy a hearty free breakfast everyday until 1p.m., tailor-made to give you those vital extra hours’ sleep after the night before. Make sure you take time to chill out in our amazing rooftop lounge with panoramic views of the breathtaking Toronto skyline. Our location in the heart of downtown Toronto is minutes away from the best the city has to offer. Kensington Market, Little Italy, the Annex and Chinatown are at our doorstep. These neighbourhoods are famous for their diverse mix of bars, restaurants, cafes and great shopping opportunities. We're also a short walk away from the Royal Ontario Museum, the Art Gallery of Ontario, the University of Toronto and the Bay Street Bus Terminal, with excellent transit links nearby. Free use of iMac computers. Free coffee and tea available all day. Free personal lockers with integrated power points for charging laptops, phones, cameras etc. Pre-made beds with free towels. Maximum number of guests per booking is 6 people. Maximum 14 nights stay. 2 nights minimum stay required. Please note - we do not admit guests from Toronto or the Greater Toronto Area. Guests must be over 18 years old to stay in a dorm. Minors accompanied by an adult can only stay in private rooms. Guests must have a valid photo ID and credit card. We accept Visa and MasterCard (no American Express or Maestro). We have a 24 hour cancellation policy, guests must contact us before 12pm on the day before their arrival to avoid being charged. One of the best hostels I ever stayed at. Wonderful staff. Clean. Central. Amazing view from the roof. Anthony, the owner, was really engaged in taking care of the customers. And the hostel arranged fun activities each evening. I'm definitely going to stay here the next time I travel to Toronto. A really nice hostel with a great atmosphere. Nothing to really complain about at all. Since there is always room for improvment, I would wish more recycling of garbage and less squeaky beds. Although, I would absolutely recommend this hostel to my friends! Nice hostel in an interesting and vibrant area (Kensington). Easy to get around with bikeshare and public transport. Breakfast and lockers included in the reasonable price. Thumbs up, would recommend.